Sorry for the unexpectedly long absence there, but things just caught up with me. Last week we were finally able to take Spencer to the vet to get his bum knee fixed (we had to wait for him to stop growing); he had a torn CCL and needed a TPLO procedure. Don't feel bad if you have no idea what any of that is; the bottom line is that the surgery went really well and we're counting down the days (just 5 more left) until he gets his stitches out and has a recheck to make sure he's healing properly. He's still looking handsome, even with his leg in a cast. Since then we've had our eyes on him all the time, trying to prevent him from chewing at the stitches or jumping around and doing further damage to the joint. So far so good, but 7 more weeks of this seems like forever at this point. The harness he's wearing in the photo has a handle on the back so we can help him on and off furniture and up and down the stairs. Over the weekend I headed to Sacramento to visit my family, leaving poor Mark to deal with all the dog drama by himself. And then of course, I have my upcoming trip to Lisbon and France quickly approaching, but thankfully by the time I leave next week, Spencer will have his stitches out. Plus by then Mark will be a pro at handling Spencer by himself -- at least that's what I tell myself. I've still been getting dressed and going to work, of course. Here I blended the soft browns and olive, and used the splashes of pale pink to bring in some contrast. The belt is one that came off a sweater, but it happened to match perfectly with the brooch. This was also another tights-layering exercise, with olive green fishnets over sheer black hose. What a handsome little man, and a brave trooper too. I read somewhere that to keep them from bothering their stitches, just tie some gauze bandage around their *good* leg for a few days, and that's what they'll focus on! I can't vouch for the advice though. I love your blend of muted colors - very pretty! Aw, poor Spencer. I've had a dog laid up like that and they find it impossible to resist chewing on their bandages. Good luck. Poor puppy. I hope the next 7 weeks go by quickly. I love your skirt. Gorgeous! Aww poor little guy. I'm glad he finally got to get his surgery, and I hope his healing is going well. Those boots are incredible. I love the rich brown color and the sheen of the leather. Such a great way to wear mixed neutrals. 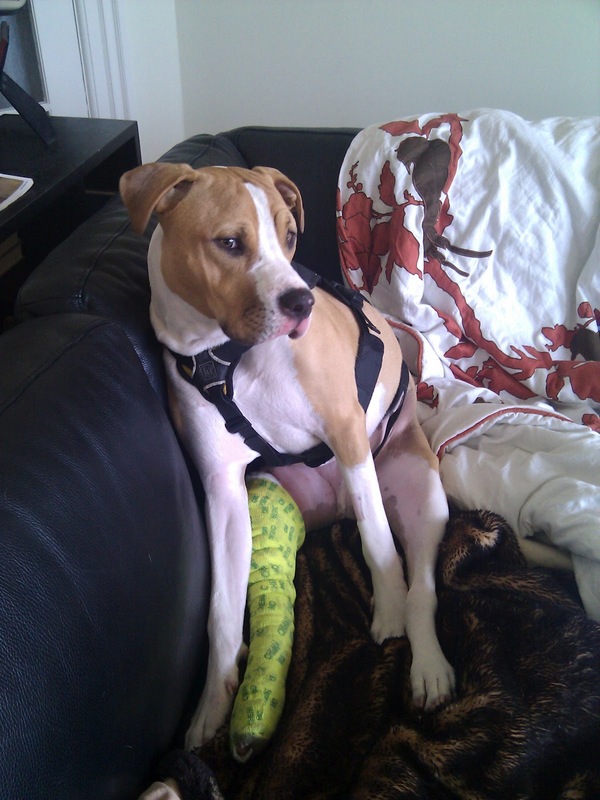 Awww pets with casts are just the most pitiful and at the same time adorable creatures in the world! I hope Spencer heals up quickly. Lovely outfit, as usual! You're a dressing genius. I texted my mom a pic of an outfit recently and she said it reminded her of you and I almost died of pride. Hellz yeah! Aw, poor pup, glad his surgery went well. Love the outfit, Audi - that skirt is amazing and I love the layered tights. Hi that’s very beautiful fashion collection. Hope your puppy feels better soon! I've been a reader for a while now and have enjoyed your blog posts but never have commented until now. I am a pinterest user and like to collect images of outfits for inspiration later. 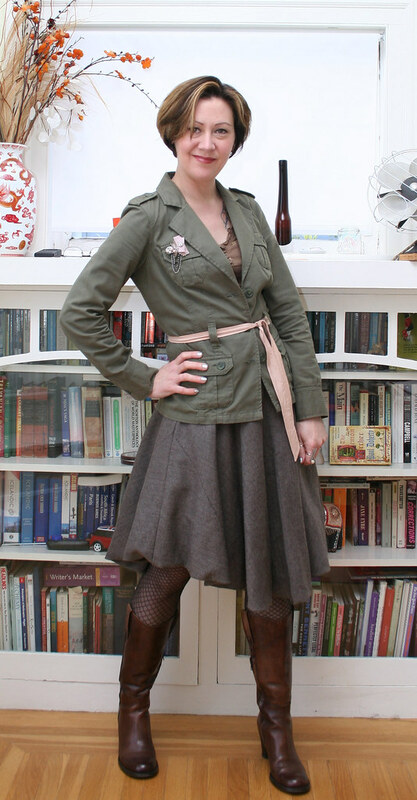 I really liked how you choose a different colored belt for the jacket and so I tried to "pin" this blog entry but I wasn't able to pin the images in your blog. I don't know if you have it set up that way on purpose or not but I thought I would drop a line just in case. Maybe you just don't want people to steal the images which is understandable.